Goreyosity Shop: An Exhibit and Auction of New Artwork Created from the Collections of Edward Gorey, is an inspired repurposing of materials from the vast collections (or, The Wondrous Hoardings) of author/artist Edward Gorey into new works of art and fine craft by local artists. A benefit for the Edward Gorey House in Yarmouth Port, Goreyosity Shop is the result of 26 Cape and off-Cape collage and assemblage artists, fabric artists, illustrators, sculptors, furniture makers, miniaturists, jewelry makers and painters being allowed to rummage through Edward Gorey’s barn. Clothing, fabrics, small metal objects, large metal objects, very large metal objects, architectural remnants, glass, beads, kitchenware, ceramics, tiles, cutlery, partially intact books and magazines, and plush toys have now all returned as new works of art—either decorative, contemplative, outrageous, wearable, useful, or otherwise. There is every possibility that you will want to own one, or more, of them. Goreyosity Shop exhibits in the Great Hall Gallery from Wednesday, May 22nd until the culminating Goreyosity Shop Gala Auction on June 1 at the Cultural Center of Cape Cod. Join us at this incredible event to experience music by Broadway Central, delicious food and lovely libations, and the auctions, both live and silent. More information can be had by contacting the Gorey House at edwardgorey@verizon.net or at 508-362-3909. 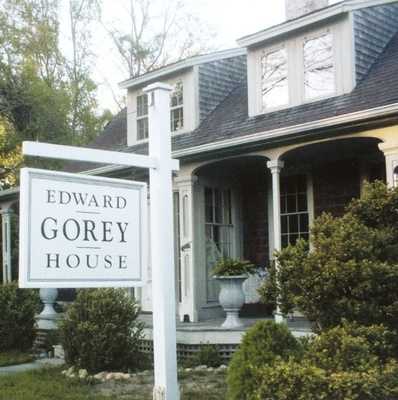 Gala: $60 / $52 Gorey House Member Discount. Free admission for exhibit during operating hours.